Many a French king has been spellbound by the beauty of this crystal, which began its legendary journey in Lorraine, France, in 1764. Baccarat is triumphantly romantic, harking back to an era of chandeliers, ornate perfume bottles, and wine-filled chalices. Of course, Baccarat candle holders continue this sense of wonder, combining couture crystal with assertive colours and a sense of serenity. The beveled circumference of the Clear crystal votive, gathered like petals, epitomizes Baccarat’s fine craftsmanship. 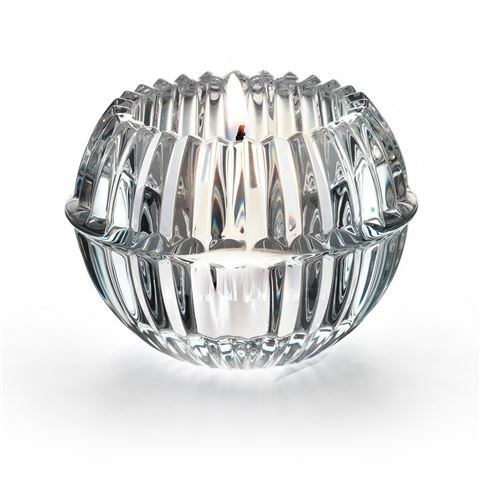 The votive creates an incredible optical effect, one where the glinting crystal and the illuminated candle glow interplay resplendently, with the multifaceted crystal enhancing every fiery flicker against its ornately grooved framework. Suitable for use with a tealight candle (included).